And here is the second mini script - addon that was implemented using mods a few years ago. Now this is a full-fledged addon for MCPE that does not require BlockLauncher or any other apps for installation. The Kill and Death Counters Addon adds two small indicators on the right side of the screen that show you how many creatures you killed and how many times you died. Counters are a kind of indicator that stores your statistics on some data. In this version there are two variables, but with the expansion of addon capabilities we will see more new functionalities. 1. Count your deaths. You can watch the counter increase when you die no matter for what reason. 2. Count your kills. 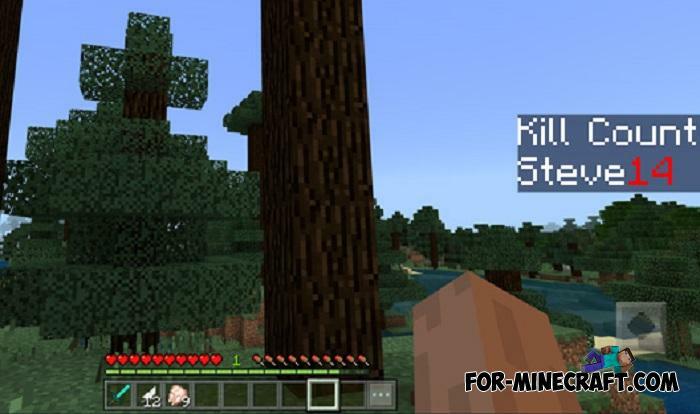 Kill enemies (absolutely any mobs) and your killings will be counted, which can play an important role in mini-games or PvE modes. How to install the Kill and Death Counters Addon? Damage Indicators mod for MCPEAs for Damage Indicators, this is what will show you the health of any entity in Minecraft PE..